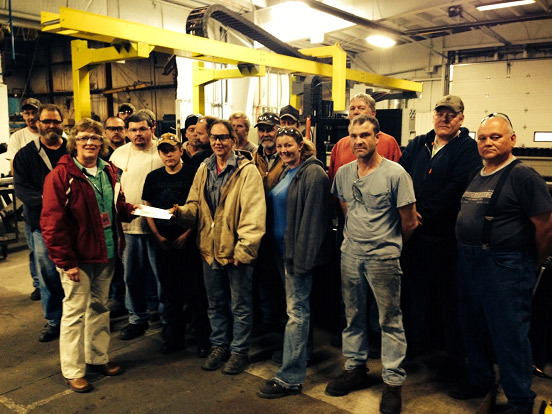 Scranton, IA - The staff of Scranton Manufacturing recently showed how they are continuing their commitment to giving back. As a part of the company's incentive program, employees earn points for productivity and excellent safety records. The points are then totaled and replaced by a dollar amount and each department chooses what they would like to do with their earnings. This year, the Fabrications department chose to donate a portion of that sum to the Jefferson-Scranton Elementary Ram Readers program. The donation will be used to purchase books for the entire student body at the Jefferson-Scranton Elementary school. Michelle Hardin accepted the check from employees and expressed their gratitude, stating "the students in our building would like to thank (Scranton Manufacturing) for supporting our reading goals."